11 Feb 2019 --- Israeli-based Algatechnologies has launched AstaPure Arava, an all-natural, algae complex that contains naturally occurring constituents of the Haematococcus Pluvialis algae. The company claims that this species of microalgae is the “richest known source of astaxanthin” and its properties are supported by research from NIS Labs, a research institute based in the US. Led by Dr. Gitte Jensen, the research has shown that Arava algae powder is highly potent and has the synergistic effects of natural astaxanthin and the whole-algae complex. The microalgae complex has various food applications such as power and energy bars, as well as any other product that can be easily combined with powder. “Under the known regulatory limitations and permits in each territory in respect to the food applications of astaxanthin, Algatech predicts that AstaPure Arava powder will become a meaningful ingredient in innovative functional food products,” Or Gottlib, VP Marketing at Algatech, tells NutritionInsight. AstaPure astaxanthin is already integrated into multiple food products, mainly by Algatech’s Japanese and Asian customers, according to Gottlib. “Our general approach is that Algatech works in close cooperation with its customers to better understand their requirements and meet the different applications in a large range of market categories as cosmetics, foods and beverages, as well as feed and all types of dietary supplements,” he notes. Click to EnlargeUsing the company’s proprietary technology to mimic the microalgae habitat and biological processes, the microalgae is cultivated organically. This process stimulates the microalgae to produce high levels of active compounds. Algatech’s ESL technology ensures the algae components remain undamaged and in their natural form throughout production. Astaxanthin has a vibrant red color and a distinct flavor, yet the company says that because it comes in such a concentrated form when used in food applications it does not alter the flavor. “AstaPure Arava is not expected to affect the taste of a product as the powder is highly concentrated, so it is traditionally used only in small dosages within the product,” notes Gottlib. According to Efrat Kat, VP of Global Sales for Algatech, the astaxanthin ingredient in AstaPure Arava whole-algae product complements the omega oils, fibers, proteins, vitamins and phospholipids that are inherent in this unique strain of microalgae, bringing the consumer all the health benefits of astaxanthin by the most holistic means and closest to its natural form. The potential beneficial health effects of astaxanthin have been widely studied in both in-vitro and clinical studies. “Astaxanthin can actually cross the blood-brain and blood-retinal barriers, allowing it to provide a positive impact on the eye, brain, and central nervous system,” Gottlib tells NutritionInsight. Further studies have also suggested that the ingredient could support skin health by improving its moisture content and hydration, skin texture and elasticity, as well as a reduction in the appearance of fine lines, Gottlib explains. The product has also shown some potential in supporting sports nutrition as well with some studies finding that, “astaxanthin [has the ability] to decrease post-exercise oxidative stress, muscle damage and heat stress, and to improve performance,” he adds. Algatech continues to promote multiple microalgae-derived products, such as FucoVital and AstaPure. “During 2019, Algatech is expecting to introduce new innovative products and delivery forms based on the AstaPure Arava powder, including meaningful partnerships with the leading nutritional supplements companies in the US and worldwide,” Gottlib concludes. In June, Algatech launched Fucovital, a patented, “all natural,” three percent fucoxanthin oleoresin produced and extracted from microalgae. Fucovital also touts being the first fucoxanthin product granted New Dietary Ingredient Notification (NDIN) acknowledgment for dietary supplements from the Food and Drug Administration (FDA). 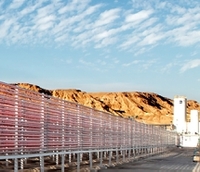 Algatech claimed to have developed a “unique” extraction process that overcomes previous barriers to the microalgae ingredient's commercialization. On the benefits of astaxanthin on the skin, a randomized, double-blind, placebo-controlled clinical trial provided strong evidence for the protective role of algal-derived astaxanthin against skin deterioration caused by ultraviolet (UV) light. FujiFilm’s research group conducted the research using Algatech Ltd.’s natural astaxanthin, already formulated in their branded supplement Astots.